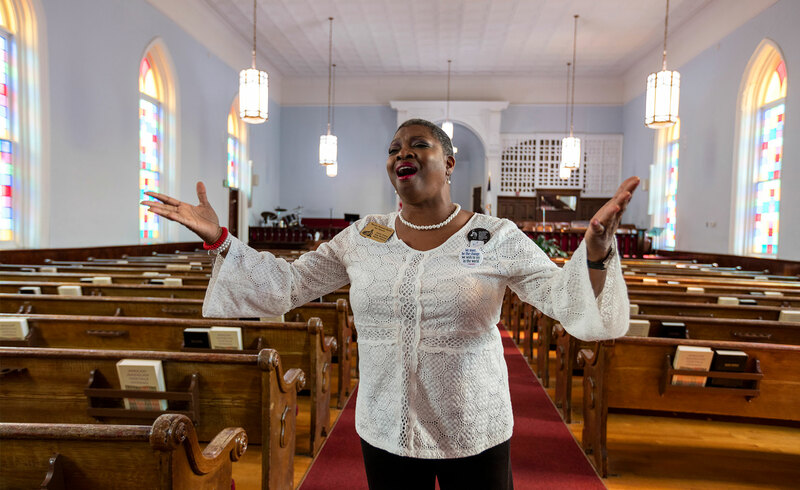 Wanda Battle, a tour guide at Dexter Avenue Baptist Church the historic red-brick building where Dr. Martin Luther King Jr. accepted his first pastoral assignment, just a block from the state capitol in Montgomery Alabama. The neighborhood that surrounds the church is immersed in compelling civil rights accounts. Rosa Parks was arrested in Montgomery for refusing give up her bus seat to a white passenger, Dr. King led the Montgomery bus boycott and visitors continue to commemorate the Selma-to-Montgomery March where demonstrators crossed the Edmund Pettus Bridge in 1965.